Wisconsin Dells makes a splash in the world of sports. 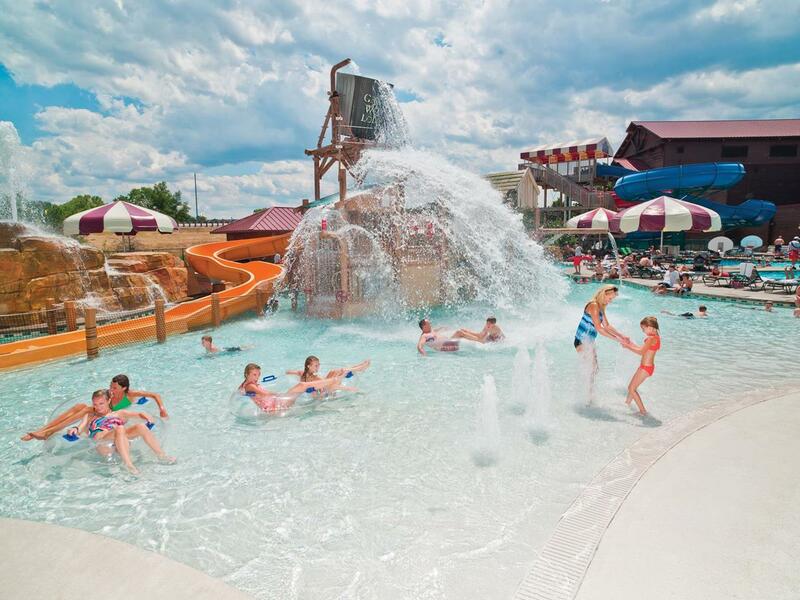 In “The Waterpark Capital of the World!®”, sports venues abound make Wisconsin Dells the perfect destination for your next group outing. In the world of sports event planning, we know there are countless locations just waiting for the chance to play host to your team. And it’s your job to find that perfect destination that will help you hold the perfect event and keep everyone entertained – both during games and in the down time. Facilities, services, food and fun all come into play and help to make the event a hit with players and families alike. So where can you find this ideal location for your next sports event? In the upper Midwest, many sports planners have selected Wisconsin Dells as their go-to location because it offers all that – and a lot more. 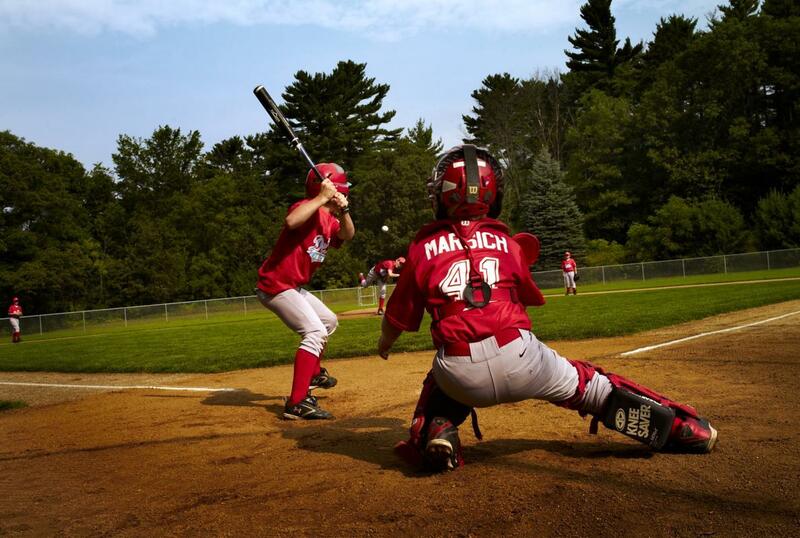 Wisconsin has a long tradition in sports and outdoor activities, so it makes sense that all the facilities in and around the Dells are top-notch and no stranger to hosting major tournaments, clinics and invitationals year- round. The Freestyle – Greco State Wrestling Tournament, USSSA Buffalo Cup baseball tournament and Boys High School Soccer Invitational are just a few of the major events that have been hosted here. Wisconsin Dells has certainly made a name for itself as a popular Midwest family travel spot, and is forging a path to become known as a great all-around sports travel destination as well. What can our group do in the Dells? When picking the perfect destination for your next sports event, everyone will be eager to know what there is to do off the field or the court. In the Dells, the short answer is: Waterparks. Home to more indoor and outdoor waterparks, per capita, than any other place on earth, Wisconsin Dells is home to both Wisconsin’s largest indoor waterpark AND America’s largest outdoor waterpark. People flock here year-round for high-intensity thrills on over 200 waterslides and other water rides that have made the Dells famous. Noah’s Ark Waterpark, Mt. Olympus Water & Theme Park, Kalahari Resort Waterparks and Wilderness Hotel & Golf Resort are just a few of the big names your group will love to check out. But there is plenty of fun to be had out of the water, too. At indoor theme parks there are rides – both tame and thrilling – available year-round, and in the warmer months you can enjoy zip line tours, go-karts, golf and mini-golf. We know how important dining can be when planning a sports event out of town. After all, athletes need plenty of food to perform at their best. Head out to the Dells’ many exceptional restaurants to chow down on all sorts of cuisines, whether you’re in the mood for American diner-style favorites or some zesty international fare. Players can treat themselves to some locally crafted fudge, candy and other tasty morsels and take some home as souvenirs of a successful trip. Our venue partners, Noah’s Ark and Tommy Bartlett were a pleasure to work with as was everyone at the Dells VCB. This is one of our easiest venues to work with. The police, fire and EMS departments are very easy to work with and very accommodating. Any player is sure to feel like a star in this massive 53,000-square-foot multi-use center, complete with six full-length basketball courts and 10 full-length volleyball courts. 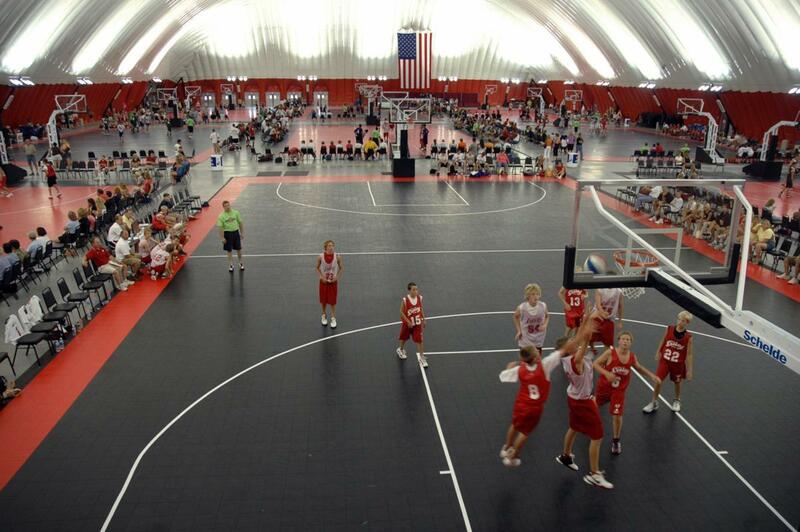 JustAGame Fieldhouse is the ideal place to host basketball and volleyball tournaments and clinics year-round. Marvel at the 94-foot-long Court of Champions, which comes with seating for over 1,700 fans and a balcony/VIP area. For the players, there are four locker rooms and an on-site sporting goods store to make everyone feel like they have the home court advantage. And for the spectators, there’s a concession stand to handle any snacking needs. Parking on the street is free from Sept. 15 to May 15; the rest of the year, meters are used. Hit the ice at Poppy Waterman Arena – also known as Lake Delton Ice Arena – the ideal venue for any skating event. From July 15 to May 1, the 85- by-200-foot arena space is the perfect host for hockey tournaments, figure skating competitions and invitationals. From May until mid-July, the ice is transformed into 17,000 square feet of concrete floor space that has been used for everything from dances to the Wisconsin Dells Bean Bag Toss Tournament. Full concessions are open during events, and free WiFi and an ATM also cater to all visitors. Players will appreciate the Pro Shop, which sharpens blades and stocks hockey sticks and ice skates in case anyone needs an emergency replacement. Players and fans alike will love this recently renovated baseball park. With two baseball fields facilitated by Little League International Field, you can be sure it will be a location to remember. Rotary Park also offers a playground for non-participants, a picnic shelter to gather for those post-game snacks and on-site restrooms. Perfect for just about any indoor sport you can think of, Woodside Wisconsin Dells Center has made a name for itself among sports planners. Home to 16 volleyball courts in 90,000 square feet of open space, it can easily host tournaments or events of all sizes. 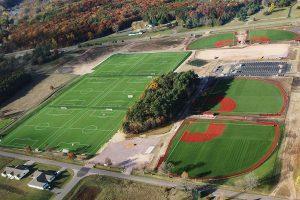 There is also a large, single multi-purpose field that can has hosted lacrosse, soccer, and football among other sports. On-site parking and an additional 13,000 square feet of pre-event space make this venue super convenient and easily accessible. 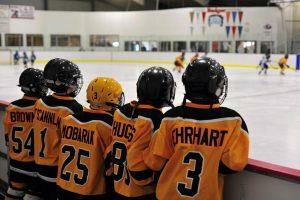 With the assistance of on-site tournament directors, you can be sure that any event you host will run smoothly. 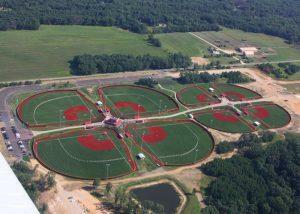 Enjoy your games outside at this 245-acre parcel of the Woodside Sports Complex. With eight synthetic turf baseball/softball fields, it is perfect for hosting sporting events of all sizes, games can go on into the night with fields being lit for nighttime play. This site also offers a fully stocked concessions stand, parking facilities, and will soon offer on-site housing accommodations, 10 turf multipurpose fields, 20 sand volleyball courts and a concert area with extensive seating. With the help of on-site tournament directors, dealing with logistics is a breeze. When it comes to fields, this Woodside Sports Complex site has you covered. With six synthetic turf multi-use fields and four turf baseball/softball fields you will find plenty of space to host your next sporting event, and the natural beauty that surrounds the complex is icing on the cake. There are also six batting cages, a concession and retail area, meeting rooms, on-site parking and a VIP viewing area for spectators. Teams will need to provide their own officials, but on-site tournament directors are on hand to help cope with any problems that may arise. The Dells is famed for its natural beauty and serenity in the center of lower Wisconsin, but this doesn’t mean it’s difficult to access from the big city. By Car: The Dells is conveniently located off of Interstate 90, approximately 50 miles north of Madison (Interstate 94 converges with I-90 before it reaches the Dells, and then splits off again near Tomah, Wisconsin). It’s about a three-hour trip from Minneapolis or Chicago; five hours from Des Moines, Iowa; and six hours from Indianapolis and St. Louis. By Air: If your group is flying in, the most convenient airport is Dane County Regional Airport in Madison. From there, it’s an easy drive up I-90 to the Dells. This airport offers flights to and from international hubs like Dallas-Fort Worth, New York City, Atlanta, Chicago and Minneapolis.